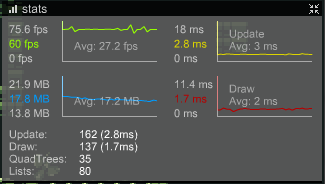 Flixel comes with a fairly powerful debugging overlay. You can open it with one of the default toggle keys (F2, ` and \ with a QWERTY keyboard layout). Note that these are configurable via FlxG.debugger.toggleKeys. Alternatively, you can do the same in code via the FlxG.debugger.visible flag. Note that the debugger does not exist when compiling with FLX_NO_DEBUG. With the default Project.xml, this is the case in release mode. On the command line, use the -debug flag to build in debug mode instead (e.g. lime test neko -debug). FlxG.debugger.drawDebug can be enabled to display the hitboxes of every FlxObject added to the state (alternatively, press the cube button in the upper right corner of the debugger). The color is customizable via the debugBoundingBoxColor property. The log window is used to display traces and can be accessed via FlxG.log. You can also redirect any trace()-calls to it with FlxG.log.redirectTraces = true;. Using it is mostly a matter of preference, some people prefer to have their traces displayed in their IDE of choice (FlashDevelop's output panel for example). 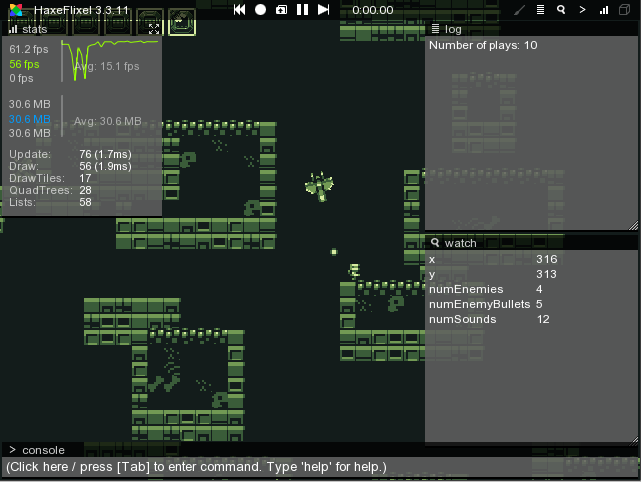 Some flixel-internal errors will also be output to the log window. It's possible to customize things like text color, size, style or add a prefix by using log styles. FlxG.log.warn(), error() and notice() use pre-defined log styles. It's very common to use trace()-calls to output the value of certain variables for debugging. However, this approach doesn't scale very well - at 60 fps, tracing the values of multiple variables results in a flood of messages. Breakpoints-debugging is great to inspect a game's internal state, but doesn't help when interrupting the execution is not an option, for example when debugging input logic. It's also possible to edit the displayed values by clicking on them, entering a new value in the text field and pressing enter to confirm. This even works with FlxPoint objects. To remove a watch entry again, simply call FlxG.watch.remove(object, variableName). Quick watches are a lightweight alternative to a regular watch entry. They don't require a variable, they simply store a value for a String name. The following example stores the result of FlxG.keys.anyPressed(["UP", "W"]) under the name "Up key pressed" - this is updated every frame since it happens in update(). To remove a quick watch entry, call FlxG.watch.removeQuick(name). Quick watch values can not be modified. FlxG.watch.addMouse() is a convenient helper to display the current mouse position in the watch window. This can be useful to find the right coordinates to position UI elements at. You can also use the console command watchMouse to call this function. 3 and 4 are especially useful when it comes to performance optimization ("Do I need to optimize my rendering or my update-logic?"). Of course this is only very basic data, profiling tools like Adobe Scout or hxScout provide much more detailed information. The Bitmap Log can be used to display BitmapData objects via FlxG.bitmapLog.add(bitmapData). This can be useful to debug logic that manipulates some BitmapData. The window provides a slideshow to scroll through logged bitmaps. You can use the middle mouse button to move the graphic around and the mouse wheel to zoom in and out. You can also inspect flixel's internal BitmapData cache by calling FlxG.bitmapLog.viewCache() or entering the console command viewCache. The console allows a limited subset of Haxe code to be parsed and executed at runtime via hscript. 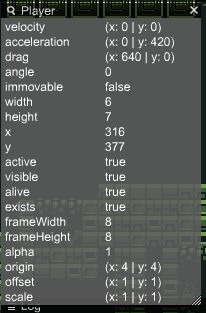 Commands like state._player.x = 50 or state._player.jump() as you'd expect. Especially on targets with long compile times, this can speed up development substantially. It also supports auto completion for class fields and registered functions / objects / classes, similar to the completion popups in IDEs (albeit without documentation, which is not available at runtime). state is the starting point for hscript and needs to be registered to the console to be available - Flixel already does this for you. The same goes for a few classes like FlxG or Math. To register further objects or classes, call FlxG.console.registerObject(). By default, the game is paused when the console text field receives focus. After a command is executed, the game progresses one frame so the effects can be seen. 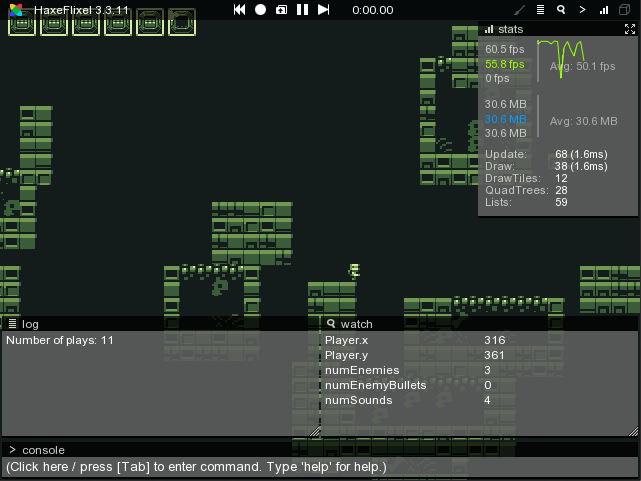 The console stores executed commands (use the up and down keys to cycle through them). This history is persistent across executions of your game (but not across different target platforms). Functions can also be registered to the console directly as commands via FlxG.console.registerFunction(). Here's an example with a function called "spawnEnemy", spawning a new enemy at the current mouse position in the Mode demo. Tracker windows are a convenient way to inspect the most important properties of a class / object. Each tracker window is basically a watch window instance. It's the only window type that can be closed. (Note: calling addTrackerProfile() causes a crash on the latest haxelib release due to a bug. As a workaround, you can call FlxG.debugger.track(null); beforehand). The left button resets the current state via FlxG.resetState(). The middle button pauses / unpauses the game. The right button pauses the game if it isn't already paused and skips ahead exactly one frame (one update() and one draw() call). This can be very useful for debugging certain issues. The circle starts a new recording - it also resets the current state, since the VCR does not support recordings that start mid-state. If a recording has already been started, the button stops it and opens a file dialog to save it. The button with the folder icon right allows loading record files and replaying them. You can add custom buttons to the debugger header using FlxG.debugger.addButton(). This is what FlxNapeState from flixel-addons does if you use it - it adds a convenient "N" button to toggle Nape's debug draw. Debugger buttons are persistent across states - FlxG.debugger.removeButton() has to be called manually to remove state-specific buttons. A debugger layout determines the initial position and size of each debugger window. The available layouts are described in the FlxDebuggerLayout enum. You can change the current layout by calling FlxG.debugger.setLayout(). The Interaction Tool, enabled by the icon in the debugger overlay, allows you to change game elements, e.g. move sprites, while the game is still running. Click here to learn more about the interaction tool.